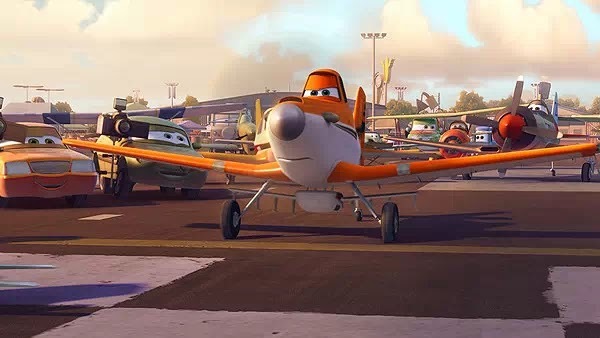 Disney’s Planes is one of the most thought-provoking films of the year. That statement is not intended as an endorsement or even a compliment, for this Cars spinout is as monotonous as it is derivative. But it posits some existential topics to ponder, if only to distract the audience from the nosedive on the screen. I reference “Disney’s” since although the film is advertised as being “From Above The World of Cars,” this is not a Pixar production. Instead, Disney—Pixar’s parent company—skyjacked their own trademark and parlayed it under the far more banal DisneyToon Studios, typically the purveyor of Disney’s straight-to-DVD dreck (which Planes was initially intended as). The result is a mix of Cars and the recently-released Turbo. Dusty Crophopper (voiced by Dane Cook) is a cropduster that dreams of competing in aerial races. Beyond not being built for speed, Dusty’s also afraid of extreme heights. When Dusty manages to qualify for a global plane race, it ostensibly pits him against the world’s best racers … and obvious stereotypes. The Mexican plane wears a Lucha Libre mask; the strains of a sitar accompany every appearance by Ishani, the comely Indian aerial; John Cleese voices, well, you can figure it out. Of course, there are Dusty’s hometown mates, including his dimwitted bud Chugg (Brad Garrett, since Larry the Cable Guy wasn’t around) and the grizzled old codger Skipper (Stacy Keach, since he kinda sounds like old Paul Newman). 1. In this world of animatronic machinery, why do the countries, cities and other cultural touchstones retain the same names as our own: America, England, Mexico, Iceland, Nepal, China, etc.? There’s a JFK Airport in New York City, and Dusty flies over the Taj Mahal. At one point, there are references to Rocky, Old Yeller, and the story of David and Goliath. Is this Cars/Planes universe some post-apocalyptic world in which machines have become fully sentient yet absorbed humankind’s cultures, languages and even prejudices—a mechanic working at JFK yells out, “Go back to Jersey!” Skipper is modeled after a Chance Vought F4U Corsair that flew in “the War” back “in ‘41.” What, the year 2541? 2. I understand the value of will, training and ingenuity. But, there’s no way a single-engine flyer is going to best jet airplanes in any race, much less one that circumnavigates the planet. 3. What crops is Dusty dusting? Presuming it’s corn the machines convert into fuel (it really can’t be anything else), what pests is he trying to kill? Are there mechanized insects? 4. Beyond sharing the same names as our world, why would the largest population centers—such as New York City and Shanghai, China—still be located adjacent to large bodies of saltwater? Wouldn’t metallic beings likely settle in more arid climates and not where the threat of rust is highest? 5. Speaking of cities, why do their skylines sport the same skyscrapers as today, structures designed by and for humans? Before you accuse me of trying to think too deeply about an animated kids movie, these lapses are illustrative of a film that fails to follow its own internal logic and, moreover, is just plain lazy. Elsewhere in the storyline, an aircraft carrier is called the "U.S.S. Dwight D. Flysenhower" and a TV sports announcer is named “Brent Mustangburger.” How hard would it be to throw out a few more puns and made-up names? I’ve got another: After 90 minutes of putting your brain on autopilot, Planes amounts to little more than a crash-landing.